There’s something I feel you should know about me before we go any further in this blogger/blog reader relationship. Brace yourself. The arguments over who “really” wrote Shakespeare’s plays don’t matter to me in the slightest. The plays got written, I get to read them, and that’s all that matters. I’ll generously share with anyone else who likes to read them too, of course. I’ve talked before about how music moves through my studio and inspires all sorts of responses in my work, but it’s nothing in comparison to the reactions I get when I read. Especially when I read wonderful works by Shakespeare. I was recently re-reading Midsummer Night’s Dream for the umpteenth time, and I was completely swept away this time by Puck’s speech at the end of Act V Scene I. This last time, I’d read all the way to the end, laughing and thoroughly enjoying the text, and then… “If we shadows have offended…” How can a shadow offend? Creatures composed of dusky twilight and moonbeams are by their very nature insubstantial. Granted, the hijinks and pranks gotten up to by the Faerie court were, definitely, less than kind and fully substantial…. The upshot is it got me thinking of shadows, what they are, and what they might be. A shadow in the very plainest sense is the positive space of an object defined in absence of light. In my work, I use alot of what’s called negative space. Many blogs and art magazines have talked about negative space. It’s the space that’s left when you take something away, basically. Let’s say you have a sculpture of the letter M, and it’s a three dimensional item. It takes up space, both in actual physical space, and visual space. Now, let’s lay it on a piece of cardboard, and spray paint it. Remove the M, and what’s left on the cardboard is the shape of the negative space of an M.It’s the shape of something that’s not there. Like a shadow, or an idea. When it comes to artistic jewelry design, a large part of the execution of Art is wrapped up in concepts. You would not believe the classes I went through where we all sat around and talked about the reasons behind the art. What did the Artist mean when they used that hammer blow versus another? Some would say that’s absolute hogwash, and it doesn’t matter in the slightest. I’ve come to believe that the concept behind the Art can be just as important as the Art itself. I use the negative space principle in my designs because I find it fascinating. How can something that’s not actually there have depth and presence? The idea that the shape of things not seen can mold our sense of beauty and our view of the world is incredible. I think of it as something akin to gravity. So I guess it’s not all that surprising that I was struck by Shakespeare’s shadows. His use of prose and poetry to form the concepts of shadows that could offend is sheer genius. Many artists take the creation of concepts to the fullest extent possible. 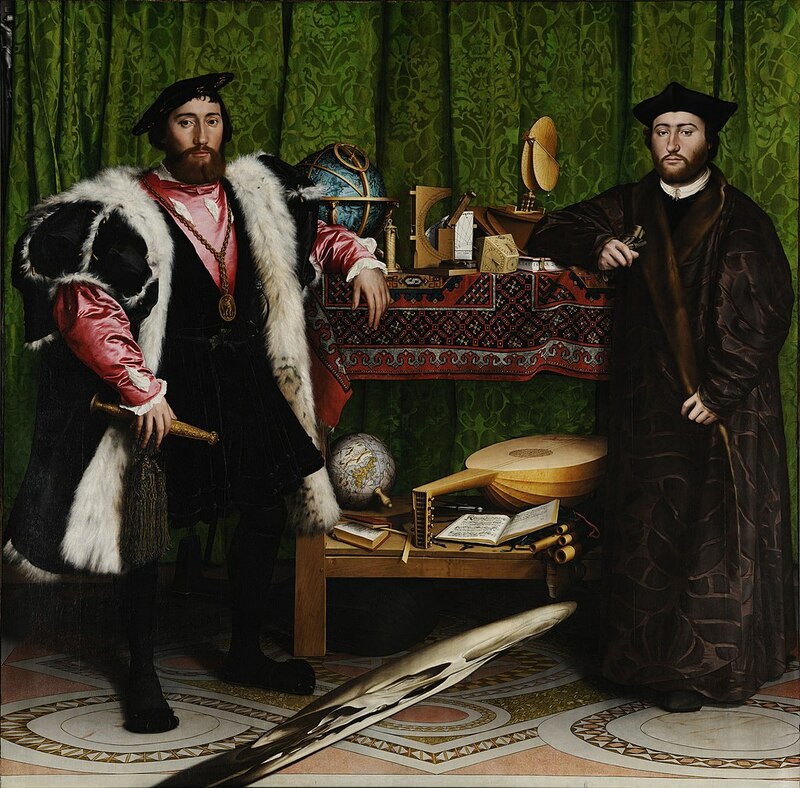 For example, in the above painting The Ambassadors by Hans Holbein the Younger, the lute with a broken string is symbolic of strife. The fact that it’s positioned next to a hymnal translated by Martin Luther could be referencing strife in the church which was prevalent at the time. But can you do the same thing with three dimensional art? Painting is a medium that just about everyone can understand. They may argue over the meanings- but nearly everyone agrees that there is a meaning. Large scale sculpture, sure. But small individual pieces worn as personal adornment….? What do you think of insubstantial concepts as the basis for design? Can you forge Hope- or even wear it? Can a pendant fully embrace the concept of possibilities not conceived?